A Tampa woman says her dog Otis died after coming into contact with a Bufo toad this week. 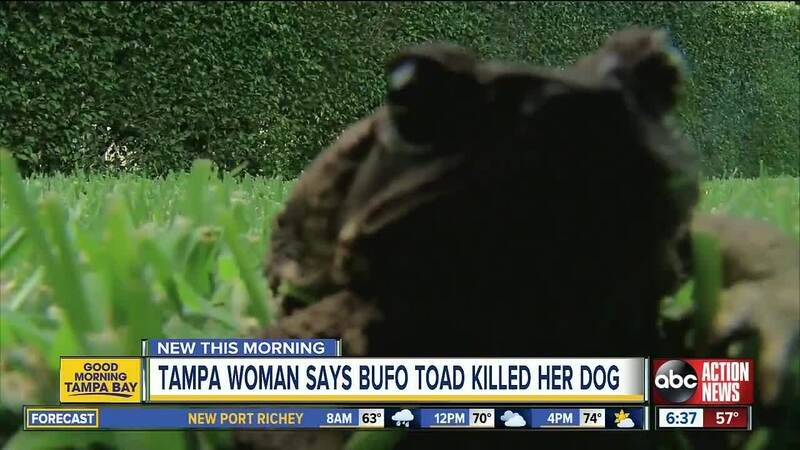 TAMPA, Fla. — A Tampa woman says her dog Otis died after coming into contact with a Bufo toad this week. Brynn Kelly explained she let her three dogs outside and she noticed Otis had not come back inside after a while. Kelly went outside and saw her dog standing in the yard with a huge toad in his mouth. She immediately knew it was a Bufo toad. Kelly ran inside to grab a jug of water. By the time she returned, Otis was seizing and foaming at the mouth. She tried to flush his mouth out with water, but soon Otis passed away in her lap. Brynn now wants to warn others about the dangerous amphibian lurking in her Riverside Heights neighborhood. She wants others to know what the toads look like and how to get rid of them. Wildlife experts say Bufo toads are more active at night and after periods of heavy rains. The toads secrete poison from glands on the back of their heads that are extremely toxic for dogs and cats. Some precautions you can take include keeping your pet's food and water indoors. Also, keep a close eye on your pet when they are outside. You can also remove bushy plants where the toads could hide from your yard. The Bufo (or Cane) toad are reddish-brown to grayish-brown with a light-yellow belly, according to FWC. They have enlarged glands behind their eyes which angle down toward the shoulders. Those are the glands that secrete the toxin. You can read more about Bufo toads by clicking here.